*I was provided a complimentary subscription to Rocksbox, but am truly hooked! Sign up using my code & get your first month free! "HEREANDNOWXOXO"
Spring - this glorious time is here! Time to break out the toes! Surprisingly, these under $20 shoes from a few years back are still holding strong. Your lavender cardigan and polka dot skirt look so great together and make a great look for spring! Fantastic skirt and shoes! You look absolutely lovely in this outfit! That wall! AH - I love it. I love Jack Rogers though - I've just discovered this brand...classic! Adorable combo, I love that skirt! I love that polka dots dress! Hey girl! I hope this means you ARE on Spring Break, enjoying yourself. I love everything about this cheery combo, that great purple cardi, the polka dots, and the fun background! Hope you are well!! Such a great look! Very well out together! I love love LOVE this, Jess! You look extra awesome against that wall so I hope you can find an excuse to loiter in that spot as much as possible without getting the cops called on you. EEEEK! This is such a cute outfit Jess! This outfit is so cute! 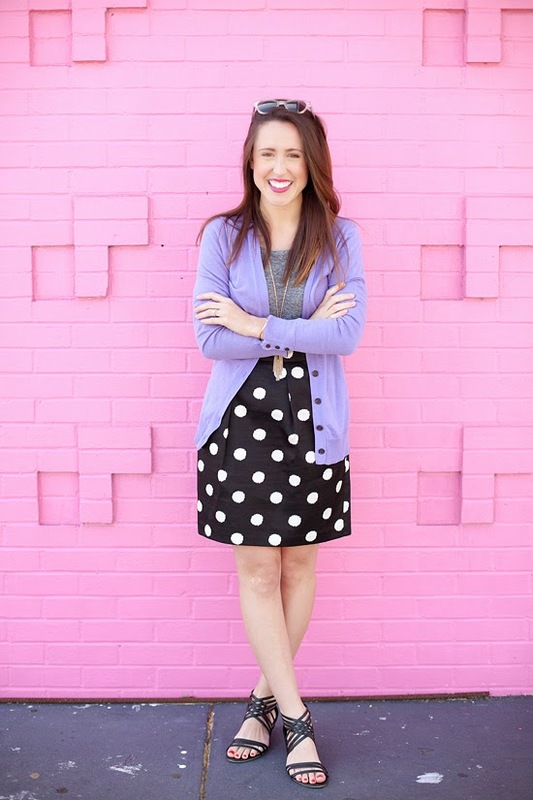 The polka dots skirt looks amazing with this lavender cardigan. You just keep getting cuter & cuter!! I absolutely love this skirt! is it hump day yet?